UC Irvine held a memorial to our great Dean, Chancellor, and President of the National Academy of Sciences, Ralph J. Cicerone. Pictures of the program are above. I will only mention a few of the highlights below. 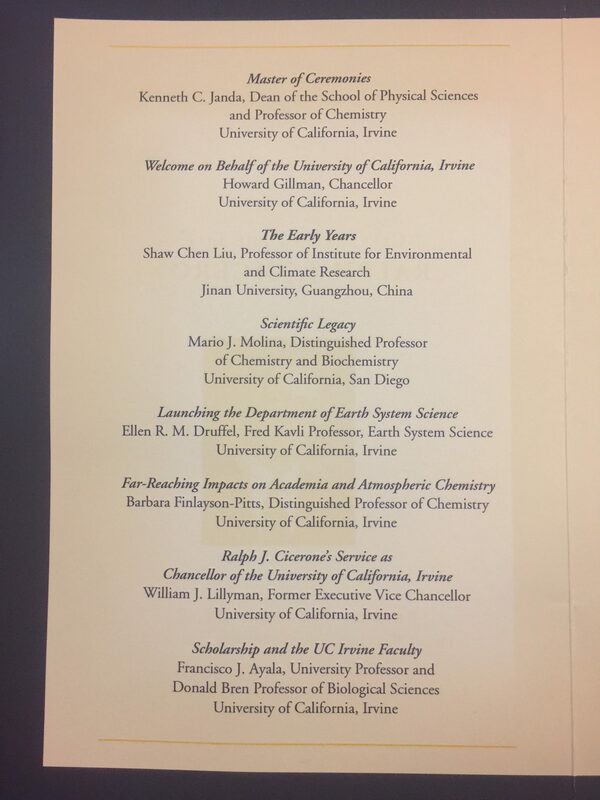 Prof. Cicerone was brought to UCI in 1989 as founding Chair of Earth System Science, and became Dean of Physical Sciences in 1994. He then became the fourth Chancellor of UCI, from 1998 to 2005. He left to become President of the National Academy of Sciences for eleven years. I had the privilege of eating lunch with Sherry Rowland for a few years after I retired and became interested in the clean energy problem, and in Earth System Science. Sometimes, Chancellor Cicerone would drop by for lunch, also. Sherry Rowland, Mario Molina, Paul Crutzen, and Ralph Cicerone were atmospheric chemists who discovered that chloroflourocarbons in fridge coolant and hair sprays would release Chlorine in the stratosphere. Chlorine acts as a catalyst to convert ultraviolet absorbing ozone to ordinary oxygen, and put us at risk of skin cancer and destroying plants. The first three scientists won the 1995 Chemistry Nobel Prize, and Prof. Molina stated that if the Nobel Prize could have been awarded to four scientists, Cicerone would have also been awarded one. 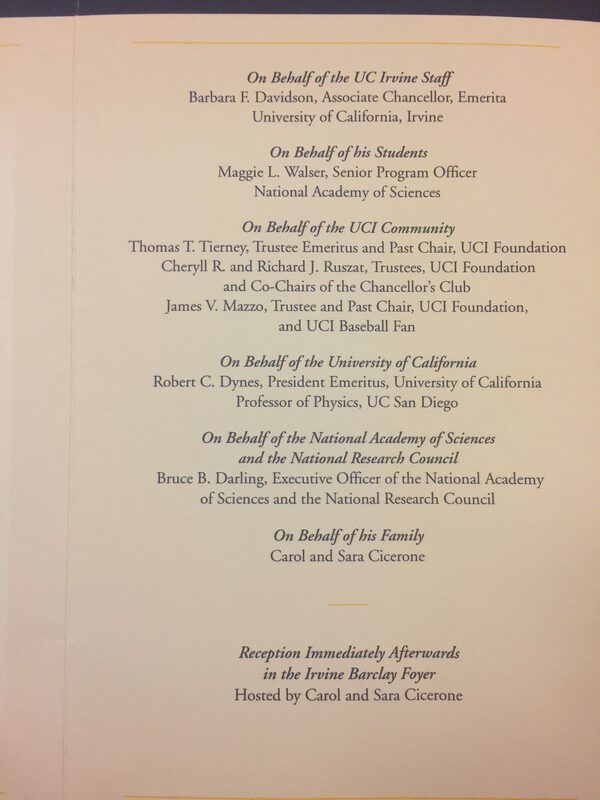 The talks were sad from Cicerone’s recent passing (Nov. 3, 2016, age 73), but also were very admirable and inspiring from Cicerone’s brilliance and accomplishments for science, for UC Irvine, and for the US and the world as leader of the National Academy of Sciences. As Chancellor, Cicerone set us on the road to recruiting research excellence, started the path to the Law School, set up the cooperative CaliT2 with UC San Diego, and brought the Western National Academy of Sciences to the nearby Beckman Center. I most appreciated the talk of Bruce Darling, Executive Officer of the National Academy of Sciences (NAS) and the National Research Council. As I read the notices of the monthly publications of the NAS, I could see the reflection of Ralph Cicerone’s concern for the health of the planet and how it affects the people on it, and issues of public health. Ralph served as President of the NAS for eleven years. The NAS is totally independent of the Federal Government, and independently funded. Ralph used to hold private get-togethers between scientists and members of Congress on key issues, for education and discussions. Everyone commented that Cicerone treated everyone with respect, and listened to their input. Many condolences were sent to the family, including ones by President Obama, Al Gore, Andrew Revkin (N.Y. Times), and Seth MacFarlane. 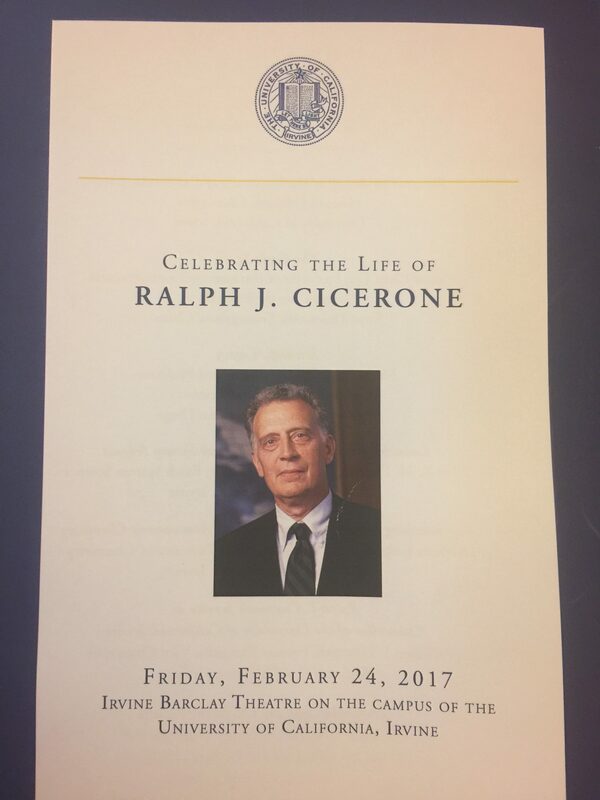 There are many professional memorials to Ralph Cicerone on the web. This entry was posted in Climate Change, Congress, Education, UC Irvine. Bookmark the permalink.